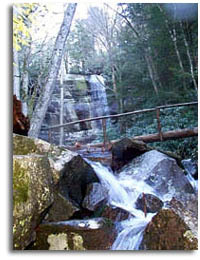 The Great Smoky Mountains National Park is rich with hiking trails. You can find about 150 trails covering more than 800 miles within the park boundaries. While all of the trails allow for foot traffic, only designated trails can be used by horseback riders. We also have a list of Backpacking Trips in the Smoky Mountain. Miles listed are in round trip or total miles for the trip listed. Click on the trail name for additional information and photos for that trail. Trail ratings are completely subjective so the listed rating is based on my experience with these particular trails; E = easy, M = Moderate, S = Strenuous. Newfound Gap to Charlies Bunion great views, icy in winter. Steep! 1,200 foot elevations gain. Not great for kids.